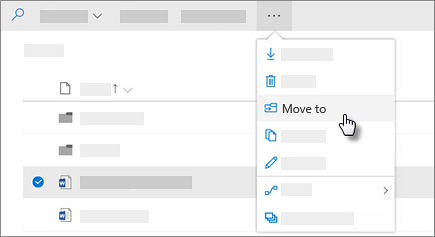 When you want to share files with a different team of people, or even give other teams ownership, you can move (or copy) files between OneDrive for Business and a SharePoint Server 2019 site. 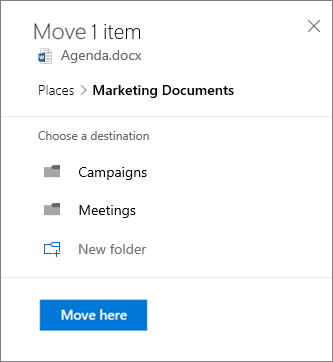 You can move (or copy) files and folders from OneDrive to SharePoint, from SharePoint to OneDrive, within a SharePoint site, or between sites. You can even move files from someone else's OneDrive to your own OneDrive. Tip: You can also move your files via File Explorer. For more information (using OneDrive to OneDrive for Business as the example), refer to Move files from OneDrive to OneDrive for Business. 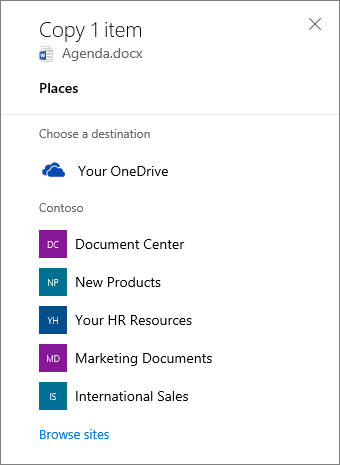 Learn more about when to save your documents to OneDrive for Business or SharePoint, as well as moving files or folders within SharePoint. Select the files or folders that you want to move, and then select Move to. Note: If you don't see the Move to command, you're probably using classic OneDrive for Business or an on-premises instance of OneDrive for Business. If so, follow the SharePoint 2016 steps to move or copy files within or between sites. Under Choose a destination, select the location you want to move to. Sites appear under the name of your organization, such as Contoso in this example. You'll see different locations depending on where you are. For example, if you're on a SharePoint site, you'll see your current library, your OneDrive, and other sites. You might have to select Browse sites to see the site you want. If you don't see any other sites listed when you move items, your organization doesn't allow moving across sites. If you're a SharePoint admin or global admin for your organization, see Allow or prevent custom script to learn how to enable cross-site moving in the SharePoint admin center. Select the location where you want the items to go, then select Move here to start moving the items. You can move up to 500 MB of files and folders at a time using the online portal. To move larger files or files totaling more than 500 MB, use File Explorer. For more information (using OneDrive to OneDrive for Business as the example), refer to Move files from OneDrive to OneDrive for Business. When you use Move to with documents that have version history, only the latest version is moved. To move earlier versions, you need to restore and move each one. For more info about versioning, see Enable and configure versioning for a list or library.